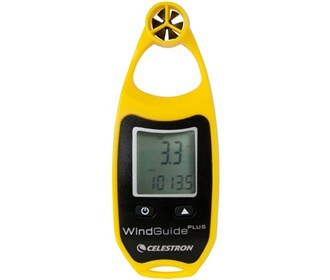 Obtain live wind and temperature readings with Celestron 48025 WindGuide Plus anemometers . Weather resistant and rugged enough for all of your outdoor activities, this pocket-sized wind meter will provide current temperature, max and average wind speed, wind chill indication, and a lanyard accessory for easy carrying. Simply point the WindGuide into the wind and view the information from its easy to read backlit LCD screen. WindGuide is your perfect outdoor companion. The Celestron Windguide Plus-Yellow has many exciting features for users of all types. You can extend the lifetime of your Celestron Windguide Plus-Yellow with the purchase of a FactoryOutletStore Factory Protection Plan. The Celestron Windguide Plus-Yellow is sold as a Brand New Unopened Item.